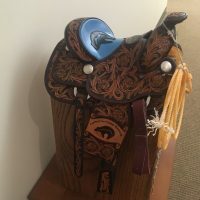 Congratulations Dr. Willman – Steward of the Saddle! Congratulations to Dr. Cheryl Willman, Director and CEO of the UNM Cancer Center! Dr. Willman won the Steward of the Saddle Award at Saturday’s Cowboys for Cancer Research event in Las Cruces. She keeps the saddle for one year, but gets to keep a custom trophy buckle and braggin’ rights forever!